Yesterday, I had the best lunch! It was delicious, healthy and filling…three absolute requirements for meals that make me happy and satisfied. I made some salad with my three new favorite varieties of lettuce…butter (bibb), radicchio and arugula. I added some small sliced carrots, radishes, cucumbers and green onions (the last 3 came from my friend’s garden so they were very fresh). A little Costco roasted chicken and a hard-boiled egg for protein. 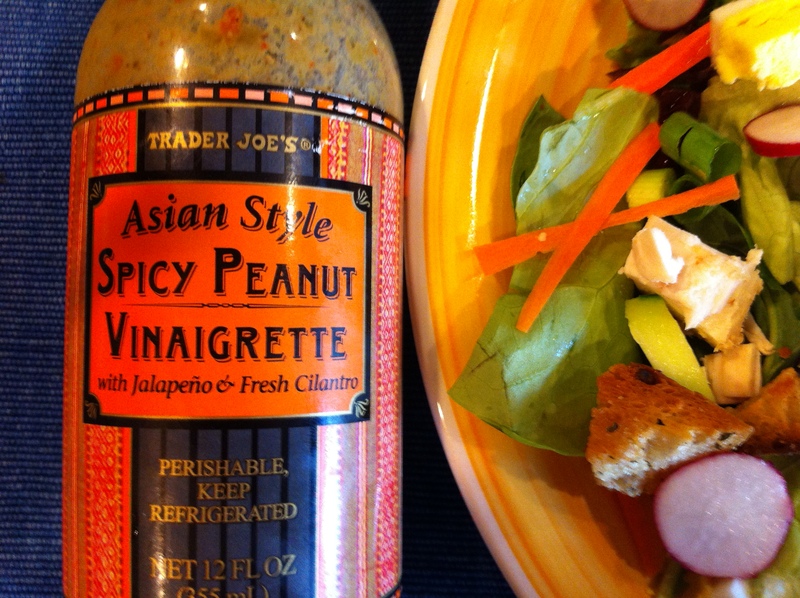 I used salad dressing from Trader Joes called “Asian Style Spicy Peanut Vinaigrette”. Or, you can use homemade dressing which is really good too (recipe follows). I also made some homemade croutons on the stove, which is faster and easier than heating up the oven in the hot summer months (recipe follows). When we were on our vacation in Italy we ordered “Ensalada Mista” (green salad) with every dinner. They always use these three types of lettuce: butter (bibb), radicchio and arugula, which are really different and tasty. The butter lettuce is soft and subtle, the arugula is kind of peppery and the radicchio adds a nice crunch that reminds me of cabbage, but without the strong taste. I get the butter lettuce at Costco $3.29 for two heads. At the grocery store, it costs $2.99 for one small head and is not nearly as fresh and nice. The radicchio is pretty expensive per pound, but the heads are small and end up only being $1-2 each. And, they last awhile because you only need a little bit to mix in with your salad. Trader Joes has the best salad dressings. I enjoy knowing that they are healthy, with no crazy additives plus they taste amazing and don’t cost too much. 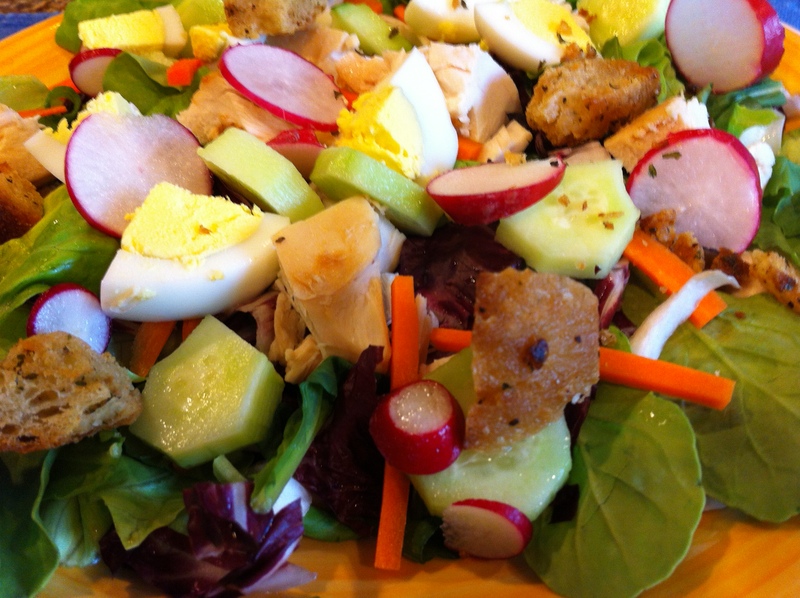 Of course, if you prefer, you can make a homemade peanut dressing (recipe follows)! Lunch met all of my food requirements…delicious, healthy and filling! Just throw it all together and enjoy! The Barefoot Contessa (Ina Garten) from The Food Network has been my cooking inspiration for years. I love the way she makes delicious, simple food, inspired by French Cuisine. I enjoy her cookbooks and her down-home style. She is seriously brilliant in the kitchen. One recipe I’ve made over and over is her quick stove-top croutons. They are so helpful when you are in hurry because you don’t need to heat up the oven, which is perfect for those hot summer months. I use them for salads and soups and just to munch on because they taste really good! As inspired by Ina, here’s what I did…I happened to have a little rustic bread from Costco (naturally). All I did was to chop up 4 slices of bread into small squares. Next I melted 1 T of grape seed oil and 1 T of butter in a frying pan. I threw in the bread squares and sprinkled them with salt, pepper, garlic granules, and parsley flakes. Then I sautéed them until the bread was slightly brown and crunchy. So good that Billy and I ate most of them as a snack before they even made it to the salad! Pour 1/3 of the can of coconut milk into a frying pan. Add ½ T curry paste and combine until the sauce is bubbling. Add remaining coconut milk, peanut butter, sugar, chicken broth, soy sauce and rice vinegar. Stir to combine and cook until mixture is bubbling and thickened. Taste before adjusting flavors; then add more curry paste and garlic granules to your preference. To make salad dressing: simply place 2 T of peanut sauce in a small bowl. Add 1 T rice vinegar and stir to combine. Pour over salad either cold or warmed in the microwave for 15 seconds. Delicious! Glad she likes it and thanks for sharing! I’m glad that she is enjoying it!